Despite only having the weekends for creative time, I have been busy this month, learning to work with my new chosen medium, polymer clay. It is quite different from the Friendly Plastic, which I was working with previously. You will see by the number of posts this month that I have been trying out lots of different techniques. I have thoroughly enjoyed all this experimenting and during April, I intend to start creating my first proper pieces. In the next few weeks, I hope to make some small decorative photo frames, with polymer clay ‘mosaic’ tiles, and also to decorate a larger, circular mirror frame. Over Easter, I need to read the instruction manual for my camera. The other day, by accident, I discovered it has a facility for close up shots that I did not know about – hopefully, I will be able to take some better photographs of my pieces, which I have been finding quite difficult because they are so small. 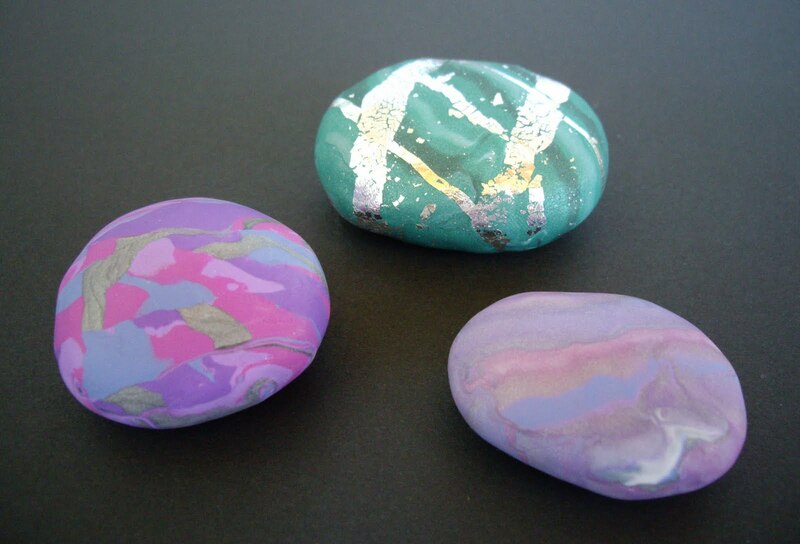 Here are my first pebbles covered with a layer of polymer clay - they have worked quite well. I was a bit concerned when making them that the clay might crack or bubble, or come away from the pebble, as I had not glued it on. However, after baking, the pc has made a nice smooth, tight fit over the pebbles. I will need to glaze the one with the metal leaf, to protect it, but for the other two, I am deciding whether to leave them as they are or to use a satin or gloss glaze to finish. Thank you to everyone at Clay-Polymer Yahoo Group for your replies to my request for advice on covering pebbles and other recent polymer clay queries. 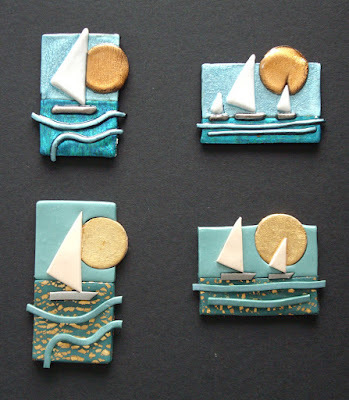 What a nice surprise - the two ‘yacht’ Art-Brooches I made from Friendly Plastic are featured on The Art of Friendly Plastic blog today. This weekend I plan to try encasing a pebble in marbled polymer clay. I acquired some nice smooth, white pebbles last year (which always feel good to hold in your hand) but have no use for them. Rather than create a complete artificial pebble from pc, I would like to cover the real ones, so that you still get that ‘weighty’ feel in your hand. It would be nice if these pebbles had inspirational words on them. I am now thinking that if this works, it would be a good thing to do with my trimmings, rather than making tiles, otherwise I could end up with hundreds or even thousands of random tiles. I could then sell these ‘inspirational’ polymer clay pebbles, as a low cost item, on my stand at craft fairs. 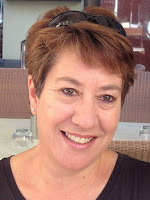 Today I discovered Gera Scott Chandler’s blog, which I am busily working my way through, reading every post. 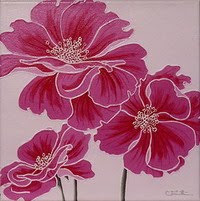 I absolutely love her work, especially the brightly coloured pieces, because they so remind me of Friendly Plastic. Gera's 'crackle' technique is fantastic - I have not seen this with polymer clay before. 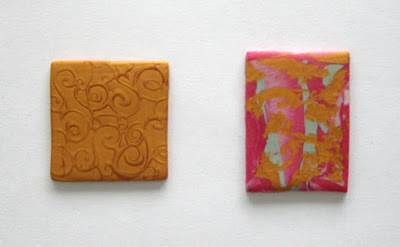 Maybe it is possible to create pieces from polymer clay that look like they have been made from Friendly Plastic (refer to previous post on Sunday March 14, 2010 'Polymer Clay vs Friendly Plastic for brooch designs') - that would be the best of both worlds. Caning was something that never really appealed to me (probably because I thought they were just used for making beads), until I saw some beautiful examples of work on the internet, where thin slices from canes had been placed in over-lapping layers – this really appealed to me, so I thought I would give it a try. For my first attempt, I chose to try making ‘ghost’ canes using translucent polymer clay, as I wanted to see how this would look if I rolled it into a coloured clay base. I made a ‘jellyroll’ cane with white and translucent pc and a simple flower cane with a 50/50 mix of white/pearl and translucent pc. Here is a slice of each of my first canes – I think they are not bad for a first attempt. Had to keep putting the canes in the fridge because the weather is quite warm at the moment and I noticed that they soon became quite soft on handling, which made them harder to slice. I am not too concerned at them looking perfect, as they will get distorted when I roll them into the surface of the coloured clay. 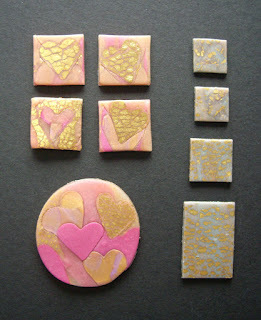 I just put thin slices on the surface of the pink tile (so the pieces are raised), as this tile had already been baked. I think they look better when they are rolled flush into the surface, as in the blue-green tiles. The pasta machine greatly distorts the shape of the cane, which creates some interesting if unexpected results. Carefully pressing with a roller, equally in all directions, helps to keep the original shape. I will need to practice more to get the really layered effect I am thinking of. I was quite pleased with my first ‘mica shift’ piece, which is quite smooth to the touch, after being sanded with different grades of wet ‘n’ dry sandpaper. It was made with gold polymer clay and an imprint from a rubber stamp. It seemed a shame to waste the raised parts of the pattern, that I shaved off with a blade, so I pressed them into the surface of a marbled tile I had just made (shown adjacent). Today I also tried an idea for a simple brooch design, using the Skinner blend technique. 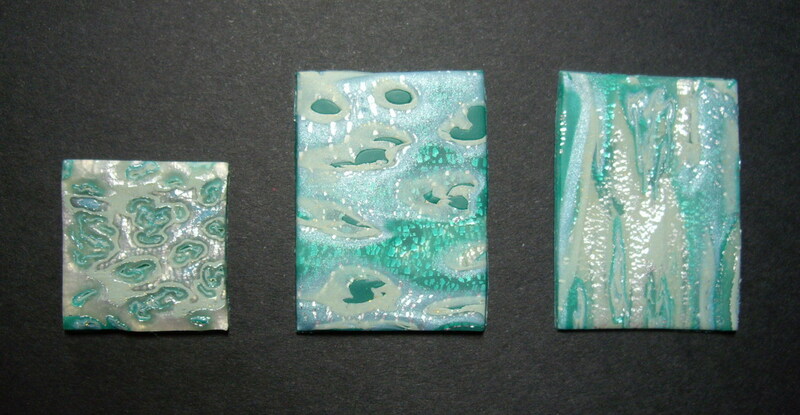 I started with a blended piece of polymer clay, made with a purple/pearl mix, turquoise/pearl mix and sea green. I have used silver metal leaf in different ways, for the moon and for the reflections on the surface of the sea. The lines have been incised with an embossing tool. As I do not have a silver leafing pen, I have used a silver gel pen (which I read about somewhere) to colour the incised lines. I will have to see what happens to it when I add a pin and backing sheet to this brooch and bake it again. I intend to coat the sea with gloss glaze, so it looks wet, and also the moon, to protect the metal leaf. It is exactly a month since my creative meltdown and I am now happy to say that I am totally hooked on polymer clay. Now I know what medium I want to work with, I just have to learn, refine and perfect my ability with it. At the moment, I am just trying out different techniques, to see which I enjoy the most. There are so many different things you can do with pc, it seems to have so much potential, that at present I can never see myself getting bored with it. This is my first attempt at ‘mokume gane’. Not brilliant. It looks quite subtle, as I did not use enough contrasting colours in my layers, which I also think I squashed together too thinly. Need to try this again after re-reading the various, differing, instructions I have collected for this technique. For a comparison exercise, I have tried to replicate my two ‘yacht’ brooch designs with polymer clay, (originally made from Friendly Plastic - Art-Brooch Designs CF034 and CF035). I have to say that I prefer the Friendly Plastic ones for the more rounded, fluid shapes and the metallic colour. The materials are completely different to use. 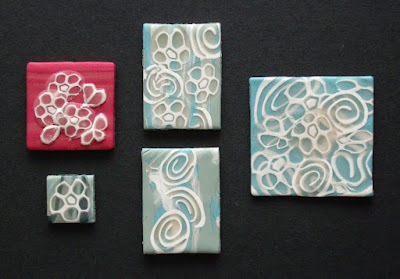 The polymer clay ones are an early attempt – still so much to accomplish. I may repeat this exercise when I have acquired more skill. I definitely need an extruder gun to get really consistently thin, rounded strips (used for the water ripples) and some more Pearlex powders or coloured foils. Note: The sails on the polymer clay brooches were quite white after the first two bakings but then I coated the brooch with satin and gloss glazes and baked again for half an hour (as per the instructions). The sails have browned considerably. I could have just put the glaze on without baking again. I wonder if baking the glaze makes it more durable? Later note: I contacted Polyform and asked if baking their Sculpey Glazes makes them more durable. After consultation with their Chemist, they confirmed that “you would not get more durability by baking the glaze vs. air drying. If anything, the air drying would be better than baking”. 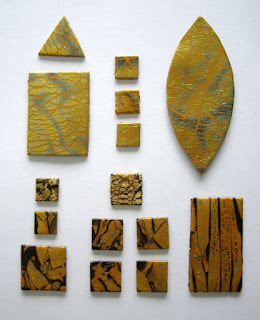 Thoroughly enjoyed playing around with my new pasta machine, creating marbled pieces of polymer clay. I do not think I could ever get bored of this. At the moment I am just cutting tile shapes out of the ‘practice’ pieces (so there is no waste) but longer term, I am thinking of creating inlaid pictures, in a complete sheet? I also absolutely love rolling the metal leaf into the surface (it is a good job I have a large supply of it – bought on my last course at West Dean College [UK] and then never used – until now). Here is a selection of my experimental pieces. I need to start designing some real pieces to make soon. I will have to order some more colours of clay and an extruder gun would be good. For comparison purposes, I decided to try creating my original design for Art-Brooch CF002 with polymer clay. I ended up trying two different methods, as the first one (replicating the way I had made the original brooch with Friendly Plastic) was disappointing. The one on the left has been made by cutting out the triangular shapes and baking in layers - it has a final coat of Envirotex Lite, to help glue it together, as it feels quite flimsy with the pc being quite flexible. 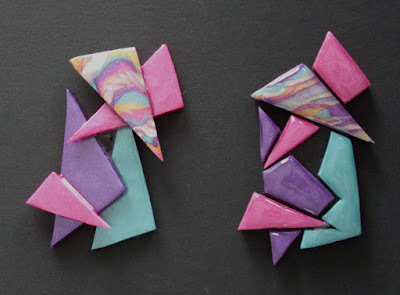 I was disappointed with the finished piece – it looks quite harshly angular and chunky, but I cannot make the pieces any thinner using this method or it will have no durable strength. (I could have sanded all the cut edges, to make them more rounded, but this would be very fiddly and time-consuming. I have since learnt that running my finger around the top surface of the edges, before baking the pieces, makes them smoother). 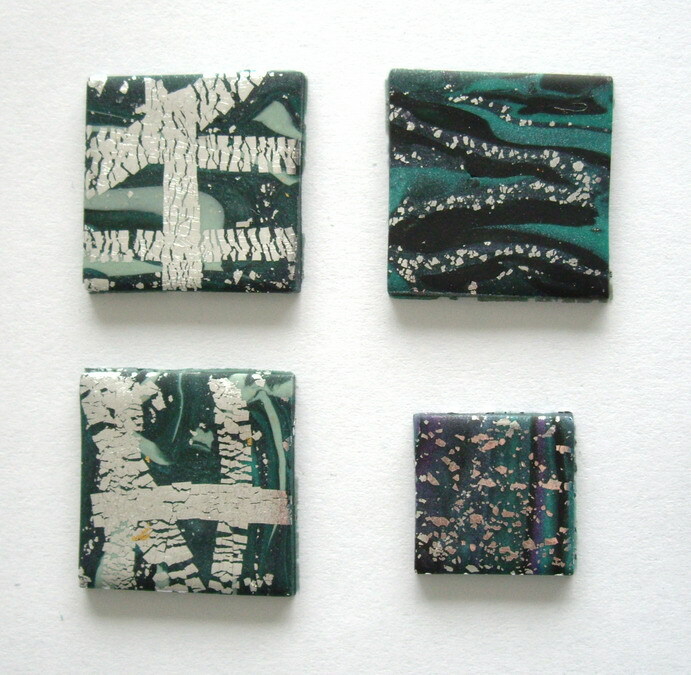 The right-hand brooch has been made in more of a ‘mosaic-style’, with each individual triangular piece being set into a solid black base layer of pc – the surface of each mosaic piece has been coated with MagicGlos. This method, although more time-consuming, shows much more promise – it has resulted in a much stronger piece with an irresistibly tactile surface. 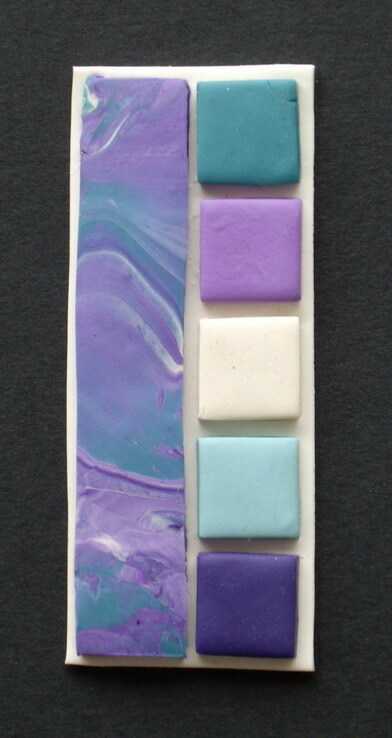 I started making a trial ‘mosaic-style’ brooch, by pressing some of the baked tiles into a base of unbaked polymer clay. They did not press in as far as I thought they would, as the base clay was quite firm. Perhaps I should try making the mosaic tiles thinner, so they do not stick out as much, if I want to put a final coat of MagicGlos on them. This is just the face of the brooch. When I come to do the back, I want to try concealing the brooch pin bar, under the backing layer of pc - I have seen some examples on the internet and it looks so neat. There will be no worry about the brooch pin coming unstuck, using this method. I guess it is not as easy as it looks but will give it a try. I need to order some stronger brooch pins for this. I am also debating about whether to sign my brooches on the back by inscribing my signature in the clay or whether to have a stamp made with my insignia (I could use the artwork I prepared many years ago, for my mirror designs, which has my initials CF in a round cornered rectangle). It is the beginning of a new month and I am all fired up to embrace a new medium for creating my Art-Brooch designs – POLYMER CLAY. Colin (my husband) says I should have an affirmation and that if you write it out fifteen times every day it will come true. I think mine will be ‘I will find creative success with polymer clay’. 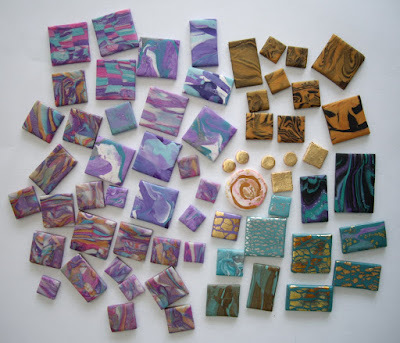 Many years ago, I did try Fimo polymer clay, but had problems getting the baking right, so never really pursued it and therefore I am a little hesitant. 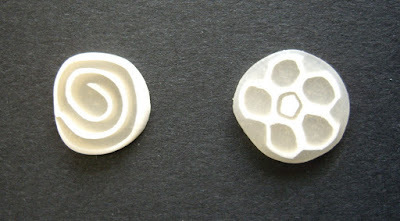 After some internet research, I have decided to use the Premo Sculpey brand, and start from scratch with an open mind. I am thinking positively because I am so inspired by the possibilities of this medium. A lot of people use it, so it cannot be that hard, and I have mastered most crafts that I have set my mind to. Again I am frustrated at the lack of available materials, tools and expertise here in New Zealand. I ordered 10 blocks of Premo from ZagZag, in Christchurch (NZ) which arrived very promptly last week. I could not resist having a little play this weekend, without any proper tools or instruction. I am really pleased with my first attempts at marbling and rolling metal leaf into the surface of the clay. The photo shows a selection of my first experimental mosaic tiles - I absolutely loved every creative minute of making these. I hope to be able to spend more time creating tiles next weekend but I really need the pasta machine and other tools I have ordered from America (cheaper than buying from NZ) to arrive. I hope this delivery comes soon – I even paid for priority mailing, I am that excited to get started. I cannot believe that as I am actually writing this, the order arrives! It is only Monday and now I will have to wait until the weekend to try everything out. This is going to be a really exciting month.